Ten years ago, in October, 2008, I first converted George Greenstein's recipe for Jewish Sour Rye from volumetric to weighed ingredients. I posted my formula here, and I make this bread with some frequency. I recently noted that I apparently never did document the baker's math for this formula, which makes it more challenging to scale up or down. So, after making a 3 pound loaf of this wonderful bread today, I worked out the baker's math, and I will share it, along with a more heavily annotated set of procedures. 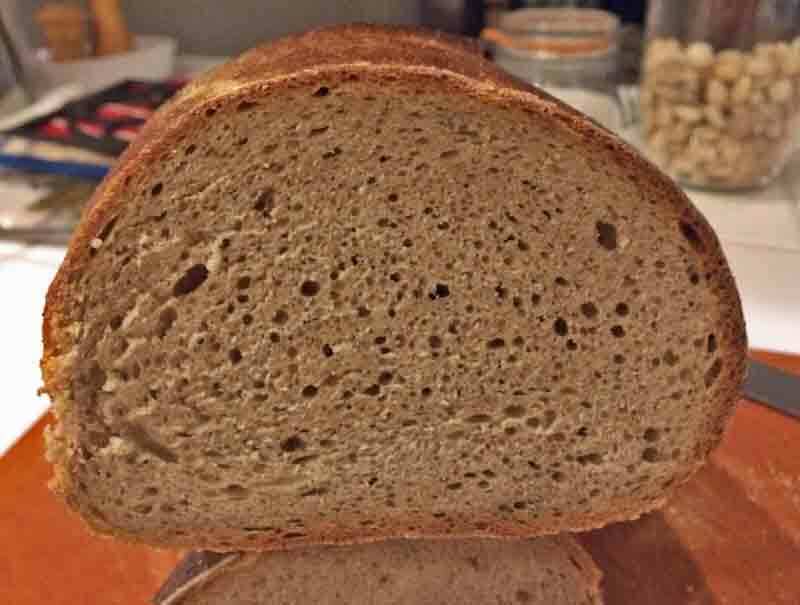 * Traditionally, the wheat flour used in Jewish Sour Rye is First Clear Flour. Bread flour (13-14% protein) can be substituted. The flavor will be slightly different. If higher protein flour is used, some increase in hydration would be needed to achieve the proper dough consistency. All Purpose flour (10-11.5% protein) can also be used, but hydration may need to be decreased. See below for more details. Two days before you are planning to bake the rye breads, active your rye sour and build it to sufficient weight, as described below. One day before you are planning to bake the rye breads, soak your altus, if using. The cornstarch glaze can be made a day or two ahead or at the last minute, while the loaves are proofing (Step 10., below). In a large bowl or the bowl of an electric mixer, dissolve the yeast in the water, then add the rye sour and altus, if using it, and mix thoroughly with your hands, a spoon or, if using a mixer, with the paddle. Dump the dough onto the lightly floured board and knead until smooth. If using a mixer, switch to the dough hook and knead at Speed 2 until the dough begins to clear the sides of the bowl (8-12 minutes). Add the Caraway Seeds about 1 minute before finished kneading. Even if using a mixer, I transfer the dough to the board and continue kneading for a couple minutes. The dough should be smooth but a bit sticky. Form the dough into a ball and transfer it to a lightly oiled bowl. Cover the bowl and let it rest for 15-20 minutes. Dust a piece of parchment paper or a baking pan liberally with cornmeal, and transfer the loaves to the parchment, smooth side up, keeping them at least 3 inches apart so they do not join when risen. Alternately, transfer the formed loaves to floured bannetons/brotformen. If using a basket for proofing, place the loaves smooth side down. Pre-heat the oven to 500ºF with a baking stone in place. Prepare your oven steaming method of choice. When the loaves are fully proofed, uncover them. Brush them with the cornstarch glaze. Score them. (3 cuts across the long axis of the loaves would be typical.) Turn down the oven to 460ºF. Transfer the loaves to the oven, and steam the oven. The loaves are done when the crust is very firm, the internal temperature is at least 205ºF and the loaves give a “hollow” sound when thumped on the bottom. Transfer the loaves to a cooling rack. Brush again with the cornstarch solution. This is a 3 pound loaf, twice the size of the Jewish Sour Rye I most often make. It was made for a "deli night" at my synagogue. It should keep a good-size portion of corn beef well-contained. This bread was made with Central Milling'a Organic Medium Rye and Breadtopia's Organic High-gluten Bread Flour. For your interest, the slices are approximately 5 inches across and 4 inches high. Flours: Jewish Sour Rye Bread, often called “Deli Rye” or “New York Rye Bread,” is traditionally made with white rye flour and First Clear Flour. White rye flour is rye flour from which the bran and the germ have been removed during milling. It is comparable to all purpose (wheat) flour. It is pretty bland in flavor, which is fine, if you don't like the flavor of rye. However, I do like rye, and I prefer to make this bread with either “Medium Rye Flour” or stone ground whole rye flour. First Clear Flour is a wheat flour made from what's left after the central part of the endosperm has been removed. The latter is used in so-called “Patent Flour,” which is the whitest (and blandest) of wheat flours, short of the bleached varieties. First Clear was regarded as somewhat inferior to patent flour in the past and was presumably relatively inexpensive. I would guess this is why it was used by the New York Jewish Bakeries for their rye breads. First Clear Flour is more flavorful than all purpose and has more color. Its flavor is distinctive. Chemically, it is relatively high in minerals, which is a good thing for both the organisms in the rye sour and for the human consumer. It is also high in protein, although the gluten is said to be of relatively poor quality. Today, First Clear is hard to find and is costly. I find that it does contribute to the authentic Jewish Sour Rye flavor, but the difference in flavor when a white high-gluten flour is substituted is pretty small. Altus: “Altus” comes from the German/Yiddish word for “old.” In the baking context, it refers to bread – generally rye bread – from a previous bake that is soaked in water. The absorbed water is squeezed out and the altus is incorporated into a new batch of dough. Altus was originally a way for a baker to re-cycle bread that had not sold the day before. Bakeries had a slim profit margin, and they could not make a living if anything was wasted. However, the practice of using altus became so prevalent that the German government eventually set a limit on how much altus a loaf of bread could contain. In truth, rather than detracting from the quality of rye bread, the use of altus – at least in small proportions – actually enhances the flavor and texture of the fresh-baked loaf. If I have part of a rye loaf that is not going to get eaten before it gets stale, I wrap it in plastic wrap, put it in a food safe plastic bag and freeze it. Then, the night before I am going to be making rye bread, I take it out of the freezer to thaw overnight. The next morning, I cut the crust off of thick slices and cut the bread into 1” cubes. I place these in a bowl and cover it with boiling water. After an hour or so, I remove the bread in handfuls, squeeze out the water and set the altus aside to incorporate into the rye bread dough I will be mixing. Cornstarch glaze: Jewish Sour Rye Bread is customarily brushed with something before and/or after baking to make the crust shiny. It could be brushed with egg white, water or cornstarch. I think cornstarch is most common, and that is what I use. To prepare the cornstarch glaze, whisk 1-1/2 to 2 Tablespoons of cornstarch in ¼ cup of water. Pour this slowly into a sauce pan containing 1 cup of gently boiling water, whisking constantly. Continue cooking and stirring until slightly thickened (a few seconds, only!) and remove the pan from heat. Set it aside. Place 20g of rye sour (or wheat-based sourdough starter) in a small bowl. Add 30g of warm water and mix to dissolve the sour in the water. Add 30g of rye flour and mix thoroughly. This will make a fairly thick paste. Smooth the past out and cover it completely with additional rye flour sprinkled over the surface in a thin layer. Transfer the rye sour into a clean, medium bowl. Add 100g of warm water and mix to dissolve the sour in the water. Add 100g of rye flour and mix thoroughly. This will make a fairly thick paste. Transfer the rye sour into a clean, large bowl. Add 260g of warm water and mix to dissolve the sour in the water. Add 260g of rye flour and mix thoroughly. This will make a fairly thick paste. You can save the leftover rye sour for the next time you bake, if you want. If so, put it in a clean small bowl with a tight-fitting cover, and keep it refrigerated. This will stay healthy for a couple weeks at least. If you want to keep it longer without using it to make bread, just do a First feeding, as described above, and refrigerate that without letting it ferment at room temperature. Ripe Rye Sour, illustrating the dry rye flour divided into "islands" by expansion of the ripening sour. I am in awe of the size of this thing! And I am surprised that only 10 minutes more were needed to bake it through. I bet it was delicious! This was a trial bake. I judge it a winner. The bake time is actually 15 minutes longer. I usually bake the smaller loaves for 35 minutes total. This larger loaf was baked for 50 minutes total. FYI, there are a couple tweaks for my next bake: First, if I do use the same high-gluten flour, I will increase hydration significantly. But, I will probably use a 12.5% protein "Bread Flour" rather than the 14% protein "Hi-gluten flour." Second, I will use a different shaping method. This time, I tried a new (to me) method, and I like my usual method better. 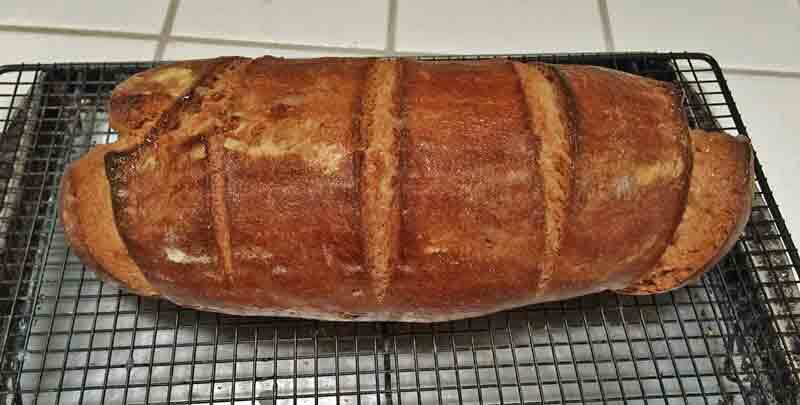 Another great bake from you as well as superb documentation and a lesson in how to make this fine bread. One look and I wanted to have a couple of slices for a nice sandwich. Must be truly yummy. I’ve been making a lot of rye breads lately using different recipes but today I decided to get ready to make my favorite Greenstein’s rye. I’ve always used your directions for this and I decided to check if you’ve made any changes or additions to the method. I typed your name and rye bread in google and up this came. Amazing, you added this just yesterday. Timing was perfect. thank you for the update, the new information is a great help. Your breads are always beautiful. Now I have to decide if I want to spend the money for first clear flour or not. Any suggestions about best FCF and where to buy it? If you really like Jewish Sour Rye, I would say you should at least once make it with First Clear flour, if only to see if it makes a significant difference to you. For me, I taste the difference and prefer it with First Clear, but not so much that I would not make it if I didn't have any First Clear. Hope that makes sense. I usually get First Clear from King Arthur Flour. theryebaker dot com also carries it. I haven't used the latter, but I trust Stan's quality products. I've attempted at making 30-40% rye with either regular whole rye or sprouted rye. The bread often came out under-proofed and sticky though it was baked to 208°F and was sliced only after 6 hours of cooling... I'm not eager to give up on rye yet but don't want to get discouraged again. I don't believe I have ever omitted the instant yeast from this bread. Note that it is a very small amount. If it were left out, the main effect would be to slow the bulk fermentation and proofing. But, since both are short already, this should be manageable. Just remember to watch your dough, not the clock. What you describe is not likely due to under-proofing. 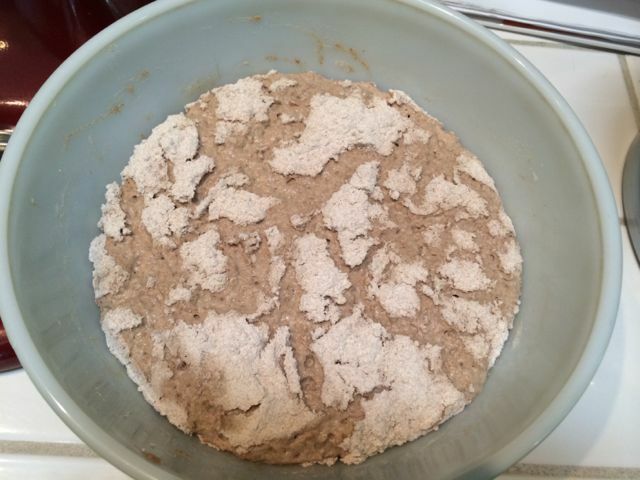 Are you pre-fermenting your rye flour or using it without fermentation? You will be more successful with rye breads if most, if not all, the rye flour is pre-fermented. The acid that develops inhibits amylase activity. It sounds like you may be experiencing the famous "starch attack." I recommend you try either this recipe with our without the IY. Or try another rye bread recipe from an authoritative source like Hamelman's "Bread" or Ginsberg's "The Rye Baker." I didn't put all the rye flour into the preferment in my previous bakes so I'll try it this weekend. For the time being, I should pray to the amylase god so that he would have mercy on me. Pastrami from Katz's happy. Some mustard, sauerkraut and some of your fermented pickles would be perfect. I wonder if there is such a thing as Jewish fermented mustard? This is some fine bread David. Thanks for sharing and happy baking. I checked and there is a Jewish tradition of making fermented mustard too. So I am making some with your pickles too! Thanks! Nice to hear from you again! I just baked 2 loafs from theryebaker site: 8-Hour Quick Sponge Deli Rye and was very pleased with the ease and results. While this recipe appears to be more complex it seems much closer to what I've been told how a Jewish Rye is made.